According to the National Center of Disease Statistics, 5.2 million children between the ages of 6-19 years have hearing loss directly related to noise exposure. CHSC is proud to announce that our Sound Choices program is now available to the public. Sound Choices is an educational program designed to teach children about hearing conservation. Although the definition of “noise” may be interpreted on a personal basis, it can be described simply as unwanted sound. Noise-induced hearing loss (NIHL) can be instantaneous and caused by just one single exposure to a very loud sound (like a firecracker or gunshot) or it can be caused by cumulative exposure to loud sounds. Even though hearing loss due to loud sound may not be evident in the childhood years, NIHL may present later, in teenagers or early adulthood. Just as we teach our children about other health and safety issues (wearing bike helmets, using sunscreen, eating healthy food), we also should address hearing wellness. Unlike other health issues, NIHL is generally invisible — there are no overt visible warning signs like blood, bruises, or pain. Young children learn to listen. As they grow, they listen to learn. Good hearing is critical to the development of spoken speech and language and thus, learning. Although permanent, noise-induced hearing loss (NIHL) is 100% preventable. If you are wearing earbuds/headphones and someone can hear your music from arm’s reach away (about 3 feet), it is too loud. The louder the sound, the less time it takes to damage your hearing. The next steps will help you limit exposure to loud sounds. Move away from the source of the loud sound. It’s one of the easiest things to do! Also, do not use noisy equipment in small enclosed spaces. Earplugs are inexpensive and easy to find at most drugstores, sporting goods stores, and hardware stores. Keep them at home, in your backpack, or in the car so you have them when you need them. Use your hands or use one finger to push the little flap in front of your ear backwards to seal off the ear canal. Close the door or window. 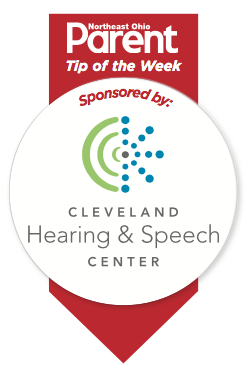 If you suspect your child may be experiencing hearing loss, contact Cleveland Hearing & Speech Center to schedule an evaluation at 216-231-8787.